Ingress is an augmented reality game from Google. It features portals, points of significance in people’s lives: statues, buildings etc. and two teams. The teams vie for control of portals by capturing them for their colour. They then form links between three portals in a triangle to colour it as a field for their team. This article is a light hearted look at the philosophy of the game. Just like the game it shouldn’t be taken too seriously :-). Ingress has to be played by going to places so is intended to promote exercise. It is like a mix of geo-caching, orienteering and a social network since the game rules promote cooperative play. Google are experimenting with technology here and maybe people too. There will be more that a few sociology papers on it, no doubt. In Zen, one is taught among other things to eschew attachments to things, and live in the transience of life. This is good advice for Ingress. Portals can change hands many times a day and perceiving them as belonging to you is likely to lead to psychological distress. Some players live or work within range of a portal and this can lead to strong feelings of possessiveness. In turn this can lead to serious resentment when the portal is captured, especially repeatedly. This leads to an interesting conflict. A player having access to a portal can use it to “farm” lots of resources for the game. If the portal is well established and several team members have helped they can often get much more valuable resources. As Ingress is a game all about resources one can rapidly see that such a portal becomes an important target for the other team. But when they destroy it are they attacking the resource or the player? And what is the perception of the current owner, who may believe they have a right to this portal. The two teams are reminiscent of the residents of Swift’s Lilliput and Blegescu, trapped in a struggle over something of uncertain consequence. But the division is even more arbitrary. The two factions live among each other and come from an almost identical demographic. And yet it takes little time for a bias of perception to creep in between the teams. All human life is here, the good, bad and ugly, with some of the latter reminiscent of the Stanford prison experiment in a darkly comic way. It is good to, as in all things, try not to offend, and try not to be offended. 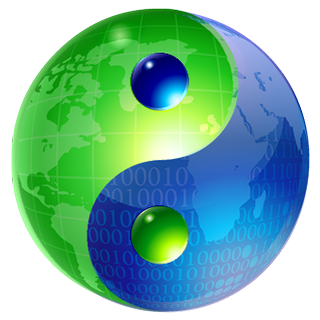 Ingress is really like the Tao, the symbol of Yin and Yang that represents a dynamic equilibrium between two halves. This is what it should be, one team rises and the other falls but for the pattern to reverse the next day. The other thing the Tao reminds is that both halves are essential and complimentary. Each half is meaningless on its own. In Ingress this is literally true. A static tableau of one team is dull and destroys gameplay which is about creation and destruction in a cycle. There will be islands that are habitually one colour or the other and this must also be in approximate balance so that both teams can resource themselves somewhat. But these will also rise and fall. An attempt at outright dominance from either team is futile for gameplay, but if semi-successful will perturb the balance of the game to deprive the other side of resource so that equilibrium is slow in returning. Of course if players on the other side become frustrated and bored they are likely to stop play leading to a Pyrrhic victory for the first side. It’s not dissimilar to the Fox / Rabbit population problem, populations will recover from extreme predation, but slowly. Even the most Enlightened players need to work hard on their Resistance against possessiveness. It is ultimately an illusion that they own a portal, an area or a given place. Feeling this way will bring misery and frustration. On the other hand it’s hard not to feel fed up of being deliberately lorded over by the other faction on your home turf if that becomes excessive. An exercise in training for players: walk fully armed with your scanner open through your own “enemy” occupied area. Don’t destroy anything, just for one walk. Not as a tactic against “them” but to see how it makes you feel to tolerate this. Trash the place another day once you have learned about yourself. On the flip side, as you enter territory in an area normally occupied by the other side or where you know one of them lives. A useful exercise might be to destroy and build but still leave something. Not because you have to but because you can and because it will let the opposition player more quickly provide a new canvas for you. Ingress is above all a game of time. The person who can throw the most time at it can win nine times out of ten, but if there isn’t an approximate balance between the factions and the time they are willing to throw at it locally the game play will come to a halt soon enough. If you (perhaps because you are starved of action) leap on everything that appears from the other faction within minutes, don’t be surprised if they get bored and play somewhere else or not at all. If you keep doing that over and over, you might actually “win”. But it’s not total war. It’s a game. If you respect the Tao of Ingress it is more likely to remain fun for everyone. Have fun and obey Wheaton’s Law :-).